This two day-walk and scramble up and around The Cathedral Range and The Razorback Ridge is part of the VCC Mountaineering Program – it is a Hiking and Mountain Preparation Trip. 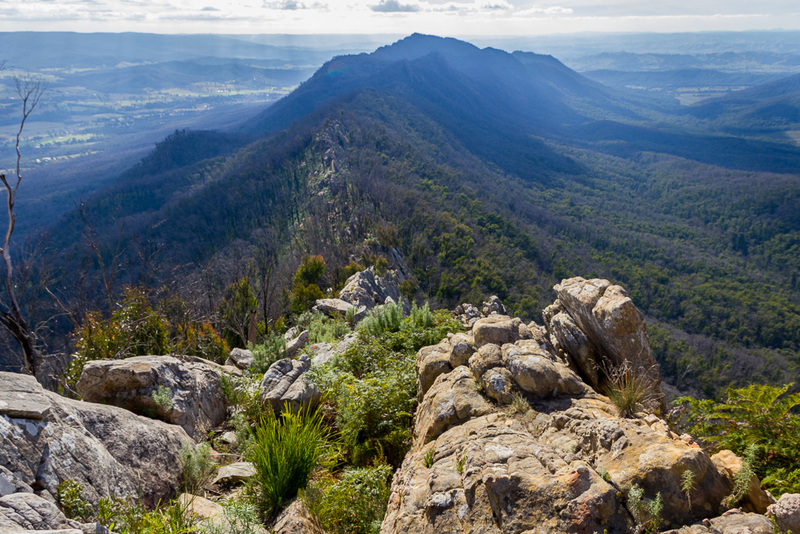 Melbourne’s best weekend scramble for aspiring mountaineers. Approx 23 km. Depending on the group’s experience and comfort levels, we’ll go up the infamous Cave Wells Track, requiring some delicate and exhilarating steep scrambling and teamwork to get past the 100 metre long cave section near the summit of Sugarloaf Peak. We’ll continue along the Razorback Ridge, scrambling most of the way for the next few hours unti l we hit the Farmyard Campsite for a well earned rest. Sunday will see us walk and scramble to the Northern end of the range, with some great views of the countryside, as we head back to the cars and a pub meal.